Often Senior Citizens are not as mobile as they would like to be. For those who can’t drive or travel, it’s easy to feel isolated and alone. They may find it difficult to connect with family and friends who live far away. 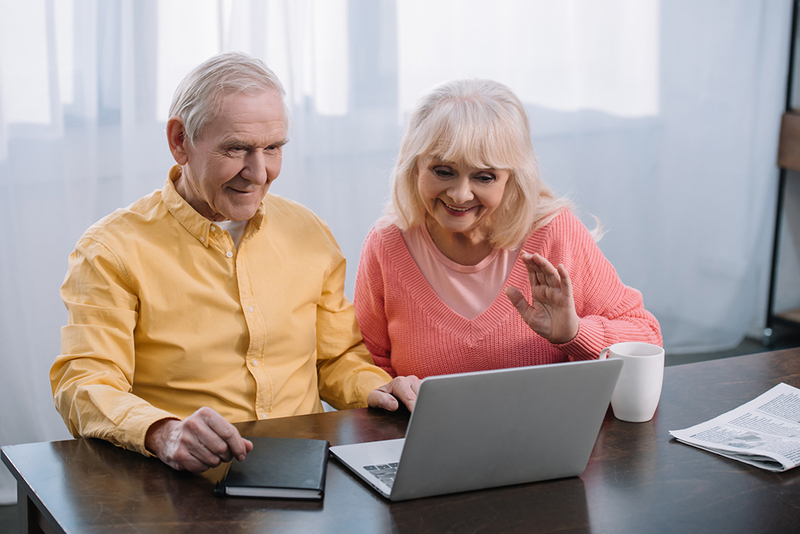 Many Seniors already stay connected via Facebook: and now video calling technology makes it easier than ever to keep in touch long distance. Various video calling services exist for use on computers, tablets, and smartphones. When you use these services, you can call a contact on your device, and both of you can see each other on the screen. Many of them will work on almost all devices. However, some are proprietary and only work on specific devices. Most of these apps are free to use. Here are four examples of the most popular video calling Software. Skype lets you make video and audio calls from your computer or smart device. The app can call from the contact list on your smartphone. Calling a contact who also has Skype is free. However, audio calls to landlines via Skype require payment. Google Duo offers simple, high-quality video calls for smartphones, tablets, and computers. The service is available on both Android and iPhone devices. You can also connect on Google’s web application from any computer. WhatsApp is a text messaging application with robust voice and video call features. This app is available for download on both the Google Play (Android) and iTunes (Apple) stores. They also have a desktop app so you can make video calls from a computer. FaceTime is integrated into all Apple devices. FaceTime is already installed on iPhones, iPads, or Macs. If you and your calling partner both have Apple devices, you can use FaceTime. Unfortunately, there is no way to use FaceTime to call Android devices. Find out what brand of smartphone your family and friends use before calling. To use any video calling Application, you need an internet connection, web camera, microphone, and speakers. Most modern smartphones, tablets, and laptops have these things built in. For older desktop computers, you may need to buy external devices for audio and video. If making video calls from a smartphone, try to do so while connected to WI-FI. Otherwise, calls may consume data from your data plan. Once you have the correct hardware, download a video-calling application to your smart device or computer. Make sure you and your calling partners are all using the same app. In the app, find the contact you want to talk to and press the video call button. The rest proceeds like a regular phone call. The phone rings, and if the other party is available, they can answer. In this modern world, we can stay more connected with friends and family who live far away. And that goes a long way towards preventing feelings of loneliness and isolation in Senior Citizens. Of course, having a Certified Homemaker-Home Health Aide or Companion Aide also helps keep Senior Citizens from feeling isolated. Your CHHHA might even know a thing or two about setting up a video chat. We are Families Helping Families. Call 908-788-9390 to schedule an appointment to see how we can assist you or your loved one.